According to Comcare.gov.au and Worksafe, over 7400 workplace injuries were caused by forklift accidents in Australia during 2003-2015, with 50 per cent of these incidents involving pedestrians, and resulting in 68 pedestrian deaths. Most Australian businesses prioritise and enable a safe working environment within their operations, given the tough Workplace Health and Safety laws in the country. However, when safety issues are ignored, the costs can be high for the person injured as well as for the business. A well-known manufacturer was recently ordered to pay a civil penalty of $150,000 for a forklift accident that caused a severe injury to an employee. 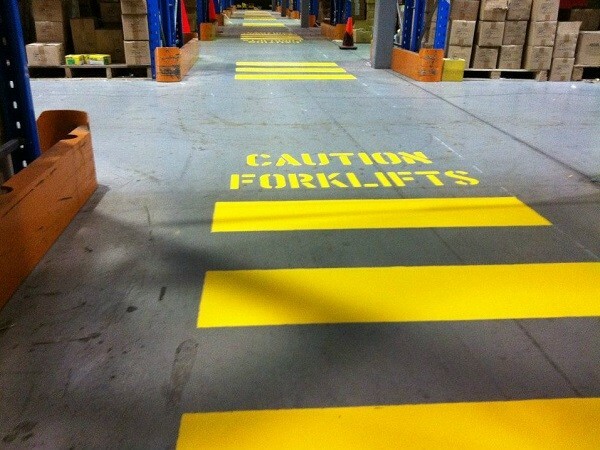 Accidents are likely to happen in environments where employee walkways cross areas used by heavy industrial vehicles. An obvious solution to this problem is to separate pedestrians from forklifts. While designated pedestrian walkways do separate vehicle traffic from pedestrian thoroughfares, there are areas where pedestrian traffic and forklift traffic intersect, creating a hazardous situation. Rotech recommends the installation of automatic pedestrian swing gates on the walkway and a boom gate across the road. Electric locking mechanisms manage the operation of the gates to ensure only one gate is open at a time. The pedestrian gate would normally remain closed with the boom gate kept open to allow free movement of forklift traffic. Pedestrians wanting to proceed across the roadway would need to push a button to lower the boom gate and open the swing gate, allowing safe passage. Once the pedestrians are safely across, the swing gate can be closed and the boom gates raised again. Rotech’s automatic boom gates are designed to ensure quick, safe and secure vehicle access control. The pedestrian swing gate openers with electronic safety and positive locking provide the safest and most efficient option for industrial gates. Rotech offers multiple options across their considerable product range including solar powered equipment and customised solutions.